On July 1st, twenty-three Augsburg MSW students and two brave professors boarded the first of three flights that carried us 9,800 miles to Bangkok, Thailand. 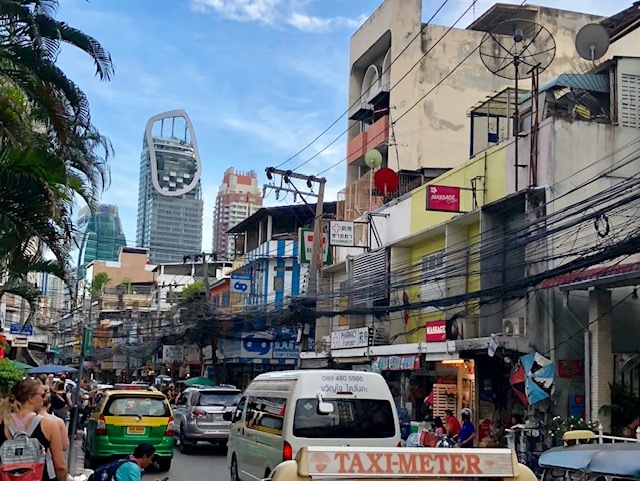 Not wanting to waste a moment of our brief time in Bangkok, we hit the ground running with tours of Wat Phra Kaew and Wat Pho, two of Thailand’s most beautiful and culturally significant Buddhist temples. After a gracious welcome dinner with our Asia Institute guides, Ms. Yee and Ms. Ouyang, and a very sound night’s sleep, we travelled to Thammasat University, where we enjoyed the first of our peer-led article discussions about social work and social welfare in Thailand. Dr. Takashi Tsukamoto, Thammasat political science faculty, gave a fascinating lecture on the complex Thai political landscape by Thammasat students led us on a campus tour, including the site of the 1976 massacre of dozens of students who were protesting the return to power of a military dictator. The profound significance of this tragedy was not lost on us, as we reflected on the political privileges we enjoy living in a country in which we can openly criticize and oppose our government. We then flew north to Chiang Mai, where we convened at Chiang Mai University to continue our peer-led article discussions and learn about Thailand’s social and economic development from Dr. Sittithep Eaksittipong; Thailand’s ethnic and cultural values from Dr. Siya Uthai; Thailand’s opium challenge from Dr. Patamawadee Jongruck; ethnic diversity and Hmong people in Thailand from Dr. Prasit Leepreecha; and human trafficking, migration, and refugees in the Greater Mekong Region from Ms. Christina Crawford, Esq. Connecting theory with practice, we visited Baan Dek Foundation, a nonprofit working with marginalized children, many of whom live in makeshift construction camps with their parents who have been trafficked into Thailand for exploitative construction labor. Our interactions with Baan Dek staff provided rich opportunities for us to explore both the importance of culturally responsive social work practice as well as the invaluable synergies of practice at micro, mezzo, and macro levels. A hike to a secluded Hmong village in the hill country of Northern Thailand provided an unforgettable glimpse into the world of the Hmong indigenous people and their struggles to maintain Hmong cultural identity amid constant social, political, and economic challenges. While in Chiang Mai the group also had the honor of learning about Theravada Buddhism—followed by 95% of Thais—and dynamic meditation from Phra KK and the spiritual value of intentional community service from Phra Ram at Wat Suon Dok. Phra KK also unveiled the wisdom of the common Thai phrase, “เหมือนกัน แต่แตกต่างกัน”—“Same same, but different”—as we explored the ways in which people around the world are simultaneously the same in many respects and different in others. Having studied the harrowing post-Secret War experience of Hmong who fled Laos across the Mekong River into Thailand, it was surreal for our group to cross the great Mekong as we headed into Laos to continue our learning. At the American Embassy’s outreach center in the capitol city of Vientiane, we were privileged to learn about the complex political history and relationship of the U.S. and Laos from Mr. Joe Narus, Chief Economic Officer at the U.S. Embassy. Our embassy center hosts also had invited Lao graduates of Embassy education programs to participate in small group discussions with us about issues related to economic, political, and social development in Laos. These discussions drove home the stark contrasts between U.S. and Lao approaches to promoting social welfare, reflecting the fundamental differences between our highly individualistic, capitalist, industrial culture and the collectivist, socialist, agrarian culture of the Lao People’s Democratic Republic. Dr. Robert Cooper, a local author and former United Nations leader of highland refugee services in Thailand, shared perspectives on ethnicity and social welfare in Laos, underscoring its struggles to balance social development with the rapid economic development driven by hydropower and copper exports to its neighbors, Thailand and China. Vientiane is home to COPE, a unique non-profit dedicated to helping people in Laos with mobility-related disabilities. The vast majority of the thousands served by COPE are people injured by the millions of unexploded ordnance (UXO) remaining after the so-called Secret War waged by U.S. and Vietnamese forces in Laos during the Vietnam War. At the COPE Visitor Centre, the group was stunned into contemplative silence by the model cluster bombs, homemade prosthetics, and artifacts crafted by Laotians out of materials from UXO and other military debris littering the landscape after the war. As we reflected on the impact of the war on the people of Laos, we learned of the on-going efforts of many non-governmental organizations to safely locate and rid the landscape of UXO. Though difficult to recognize at first, woven through this painful tapestry is a bright thread of resilience. As we slowly emerged from our silence on the bus ride from the COPE Visitor Centre, many noted this remarkable strength of the Lao people as we reflected on the day’s profound experiences. 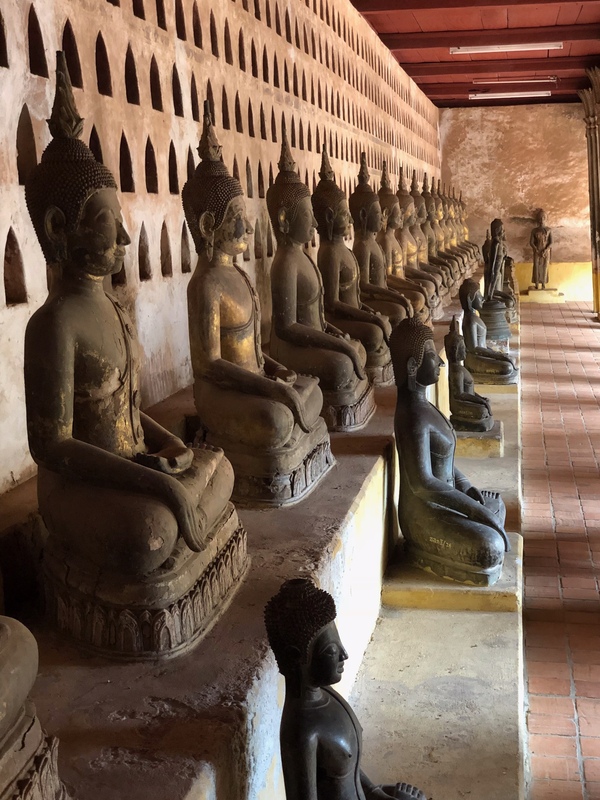 Before leaving Vientiane to return briefly to Bangkok, many of us took advantage of rare free time to further explore the rich beauty and many markets of the city by foot, motorbike, or iconic tuk-tuk. A few weeks after returning home, we came together for a much-appreciated chance to reconnect as a group and to discuss our learning abroad and its impacts since our return. Many of us noted that we were still struggling in various ways to comprehend, integrate, and articulate it all. A few key themes emerged in our group reflections. Many of us discussed having heightened awareness of our significant privilege as U.S. citizens who too often take for granted our ability to criticize and interact with our government and to rely on its peaceful transitions of power. However, many also described frustration and shame about the destructive impact the U.S. has had on nations like Laos and particular ethnic groups like the Hmong. Some shared their deepened commitment to international social work practice, especially to address human trafficking, sustainable development, and indigenous and ethnic group oppression. One overarching theme pervaded our reflections: as human beings interact with their diverse environments around the world, we are “same same, but different,” as are the ways in which we work together to promote individual and social well-being the world over. Many thanks to Professors Koh and Bosch for leading us through this transformative journey, Peggy Johnson and the Augsburg Center for Global Education and Experience for their support, and our many gracious hosts, guides, and faculty in Bangkok, Chiang Mai, and Vientiane. On my way to campus each day, I drive by the intersection of Cedar avenue and Hiawatha avenue. It was late June, I think, when I first noticed a single tent pitched on a patch of grass along Hiawatha Avenue. In a few days there were two, then 5 or 6 then twenty, then fifty. At first, I watched with a detached interest, where were these men and women coming from? Why there? I even began to appreciate the array of colorful tents. I followed the development of this growing community as best as I could in the local newspaper. Still I was somewhat distant but curious about how they are becoming more than just people living on the street. Then something began to happen. A community was emerging, support was focused on the health and medical needs or the social and behavioral needs of those whose only shelter was the east facing wall and a small nylon mountain tent. Then came the casual conversations among friends and colleagues, the hope that the city or county would work to eliminate this new community of folks. Find them housing! Normal responses, I suppose. But disturbing, none the less. Other cities have taken more drastic action. Responses that attempt to label and eliminate tent cities as public health problems. First through the use of cities ordinances used to move people along, then using police to arrest those who refused the brutish persuasion of city officials. In fact, our mayor even made the promise to eliminate the tent community by September (Serres, C. & Jany, L., 2018). There is another story to be told here, one of community cohesion and empowerment. At first, I began to notice mobile toilets and a central water station. Folks from Little Earth and Native social service agencies were mobilizing to support their neighbors. I learned that some of the members of the tent community were mobilizing to clean up the area, and to watch out for one another. A real community was developing. And as this community was moving from being invisible to being visible, disconnected to being connected, this transition attracted more political attention and with that, more organizations participating in their community by providing supportive policing, needed health care, healthy food, and even when requested searches for affordable housing. As fall is upon us and as winter approaches, my hope is that we as a community, the city and metro area are able to creatively imagine solutions that respects the ‘community’ that has emerged, the social networks that are still being forged, while at the same time building affordable and stable housing. Providing shelter and honoring community networks. Those who created the tent community are teaching us again that there should not be tradeoffs here, that we can imagine and build housing for all designed to nurture interdependence and community. Oh, and one final word on what to do with the tent community on Hiawatha Avenue. Mayor Frey has reminded us that the land? “It’s Dakota property” after all. (Serres, C. (2018, September 4). Serres, C. (2018, September 4). Mpls opens arms to homeless camp, Star Tribune, p. A1. Serres, C. & Jany, L., (2018, August 24). Minneapolis leaders unveil action plan for growing homeless encampment, Star Tribune, p. L1. Many people have asked me what I think about the Hiawatha Camp/The Camp of Forgotten Natives because they know of my experience as a street outreach worker and housing case manager. I am not an expert and I do not pretend to know what it is like to live outside. These are only my observations based on my time in the field. The frustrating thing about this camp is also the most important thing about it: its visibility. It makes me angry that even though many (if not all) of the people staying at the Hiawatha Camp were sleeping outside prior to staying there, their homelessness went largely unnoticed before their tents became visible. Homelessness was not deemed “a crisis” despite consistent pleas and warnings from advocates working with those who are experiencing homelessness that things are getting worse. We have been saying that there is not affordable housing and the shelters are full. Therefore, the visibility of the camp has actually brought homelessness to the forefront of peoples’ minds, including elected officials. However, this does not mean that everyone should flock to the camp to help. Please be intentional about listening to the community and let them tell you want they want and need. There are already outreach workers at the camp daily to provide access to services, referrals, and resources. Remember, homelessness is larger than the one camp that you are able to see. There are many things you can do to address homelessness on a systemic level. Talk to your elected officials and ask what they are doing to end homelessness. Urge them to consider more shelter beds. Even though it is unpopular to suggest more shelter beds because shelter can be seen as a Band-Aid approach, the reality is that the weather is still nice and the shelters are already full. Additionally, talk to your elected officials about making shelters safe and dignified so that more people feel comfortable staying in them. Educate yourself about the resources in your community and inform your elected officials of what is missing. Ask your state legislators to support funding for affordable housing. Urge them to consider housing options that do not break up communities. Donate to organizations that employ street outreach workers and have a mission to end homelessness. Volunteer with an organization that can train you to work empathetically and effectively with people who are homeless. Be compassionate, but also informed, about the ways that you can truly make a difference to end homelessness. Dr. Chalise is an Assistant Professor in the department of social work at Augsburg University. A few weeks ago I had the opportunity to talk with Campus Compact’s Newman Civic Fellows about systems thinking as a tool for solving complex public problems. The goal of the Newman Civic Fellowship is to provide emerging leaders with the tools they need to serve as effective agents of social change. Tackling difficult social issues requires an understanding that problems are complex and require a collective effort to solve. Systems thinking is one such approach that embraces the complexity of the problem. Rather than trying to understand parts of a system, it aims to identify and develop knowledge about the interconnectedness of various parts and the resulting system behavior. Over the past year, I have been part of a community based research team in Minneapolis that includes two community center staff members, food shelf participants, and representatives from two local foundations. Developing a holistic view of the system requires bringing diverse groups of people together, since people experience different parts of the system and interact with it differently. It is important to provide space for people whose lives are embedded in the problem at the front and center because they navigate those systems as part of their daily lives. This community based systems thinking approach aims to provide insights about the system while giving voice to those who would otherwise be unheard. A member of the food security community based research team shared that her family of four lives in a one-bedroom apartment. They want to move from the apartment building because of the rampant violence in the area. She worries about her family’s safety. However, moving to a safer neighborhood will mean allocating more money from her already stretched budget to housing. She is faced with a choice between living in a safer neighborhood and being able to feed her family. For her and many other families like hers, food programs are a life saver. Her story is not uncommon. Approximately 25% of Americans participated in 1 or more of the 15 food and nutrition assistance program funded by the federal government. A significant number of people depend on food shelves, and that number is increasing. During the first six months of 2016, there were 1.6 million visits to food shelves in the state of Minnesota, an increase of 15% from 2012. Similarly in Hennepin County (project area), food shelves have experienced a 22.43% increase in visits since 2012. The increase in use over the past few years coincides with a commitment by food shelves to provide healthier food options. Combined with their commitment to provide culturally-inclusive food and serve participants with dignity, the food shelves are attracting more participants, including from adjacent counties. At the same time, the budget is tighter than ever due to funding cuts, which resulted in closure of two food shelves in the area. The fact that food shelves are just a band-aid, albeit an utterly necessary one, is not lost either. Families continue to come to the food shelf for several years because they don’t have an alternative. The task for the community based research team, therefore, is to figure out how to provide quality services to more people with fewer resources. To do “systems thinking” simply means to explicate the organization of the system and how that produces system’s behaviors. More specifically, the goal is to develop a visual representation of the dynamic discussed above. For example, think about the food shelves’ effort to provide healthier food options. 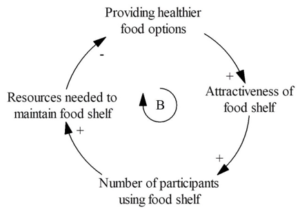 As the food shelves provide healthier food options, it increases their attractiveness and draws more people. That requires more resources to provide healthier food for more people, creating an opposing force to the food shelves’ well-intentioned effort. This narrative constitutes a balancing feedback loop (B) (see figure below), which works to control the behavior of the system. A thermostat works based on a balancing feedback loop where it controls the flow of warm and cold air to maintain temperature. In a system, every action has multiple consequences. So while a solution to the problem could be securing more resources through grant making and fundraising, this can further exacerbate the problem as an increase in resources eventually leads to providing services for more people. Even the act of grant writing, fundraising, and consequently reporting on the grant will divert resources away. The role of systems thinking is to help stakeholders understand how the system is working so they can be better equipped to design effective interventions. Food security is a complex issue and will require a collaborative effort from many stakeholders, including people who are food insecure, community centers, funders, policy makers, and scholars. Part of the reason collaborative efforts don’t work is because everyone perceives the system from their own perspective. They see their particular component of the system and have their own language to talk about it. A community based systems thinking approach integrates the various system components and creates a shared language to talk about the system. In the process, stakeholders learn from each other and understand how the system they see is interconnected with the daily lives and activities of people. With systems thinking, people from different walks of life co-create a shared understanding of the system that they could not comprehend alone; which is essential when tackling dynamic, complex problems. SWK 301B, History and Analysis of Social Policy, developed this 72 Social Policy REFORMation. Reflections on the i go home video, including things that should never be done again, REFORMs done or still needed, etc. MSW students travel from Minneapolis to Slovenia, a report by Michael Schock, Ph.D.
On June 26 of this year, ten MSW students from Augsburg, Emily Glynn and I (Mike Schock) paraded through four airports, three take offs, four landings, and travelling 30 hours arrived tired in Ljubljana, the capital of Slovenia. To our relief we were warmly welcomed by Profs, Šugman Bohinc, PhD, and Ana Jagrič, Fakulteta za socialno delo, Univerze v Ljublijana, and their students. After a brief trip to our hotels, we were guided (on foot) to the School’s center and welcomed by Prof. Gabi Čačinovič Vogrinčič, and eight Slovenian social work students. Our warm welcome included a brief introduction to the two-week course, Constructive Social Work as the agent of co-creative dialogue, with student led presentations on Slovenia, a brief history, current demographics, social forces, and geography. At the end of our first very long day, the U.S. students and faculty shared an evening meal at a local café and then headed off to our hotels. On day two we began early with more student presentations on current social policy in Slovenia and then a visit to Kings of the Street – a drop in day center for people who are homeless and a tour of the city. Every three years Augsburg social work students visit the University of Ljubljana and each visit our students carry a very different political aura. Travelling to Europe in the time of G.W. Bush was difficult in part because his foreign policy was being roundly criticized in European political circles. On the other hand, travelling to Europe in 2011 or 2014, U.S. students could be proud of the progressive agenda set by the 44th U.S. President, Barack Obama. However, a visit to Europe in the era of Trump held for us foreboding and worry. How do we explain the election or for that matter, the sudden rise in anti-Semitism, Islamophobia and racism in the U.S.A? What will the sudden impulse towards U.S. nationalism and isolationist rhetoric mean to our hosts? We did not know how we would be received by our Slovene hosts with their tradition of liberal political and social ideology, community and national cohesion and progressive social policies? Our students expressed other more mundane reservations, reservations about language and money and the worry of getting lost in an unfamiliar country. At the same time, we arrived in Ljubljana believing that our hosts would introduce to us a new world of social work practices and welfare policies. That we would be introduced to a country whose history and architecture was both centuries old and decades young. But most of all, we arrived with the hope of engaging in conversations with our Slovene peers that would challenge us to approach our profession in new and creative ways. From the moment of our arrival, our hosts Lea and Ana, and the summer school students welcomed us with great warmth, enthusiasm and in a language that we could fully understand… English. 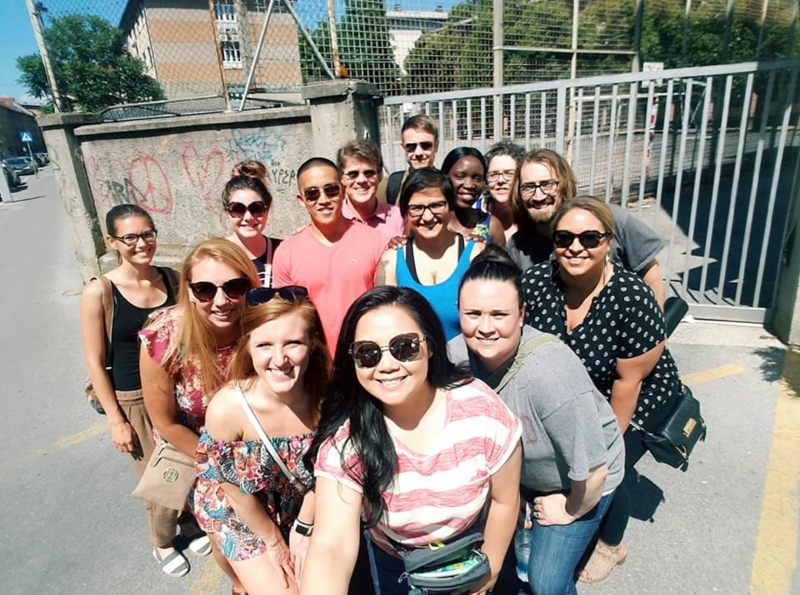 From that first day, students from both Ljubljana and Augsburg began to build friendships over food, mutual curiosity, and a shared passion for social justice. Drawing from my students’ journals, I discovered that most of our students were able to engage with the instructors, students and agency staff with curiosity and a healthy dose of cultural humility. As is common in international education, our students began to doubt their own approaches to social change and social justice. For instance, our visit to the national prison was so challenging that some of the students spoke despairingly about the criminal justice system in the United States. Following the visit to Association LEGEBITRA, our students were amazed and a bit jealous of the agency staff’s personal relationships with political agents such as the mayor of Ljubljana and federal government policy makers. Our students were also introduced to beneficiaries of Slovenia’s social welfare programs. The most stirring experience was a walk around the city with guides who were formerly homeless and recovering from their drug addictions. While introducing our students to the more interesting neighborhoods, our guides talked about their personal histories, their failures and victories. In their personal stories, we witnessed first-hand, the long and hopeful journey into and out of addiction and homelessness. Nearer the end of our two weeks, students began to ask tougher questions, questions about Slovenian national identity and multiculturalism, about the legacy of Tito’s vision of a united, multi-ethnic and socialist country against the newly discovered freedom inherent in a capitalist economic system. How does the feast and famine of the free market support or challenge the socialist values of the past century? How do you include new immigrants without colonizing their culture? 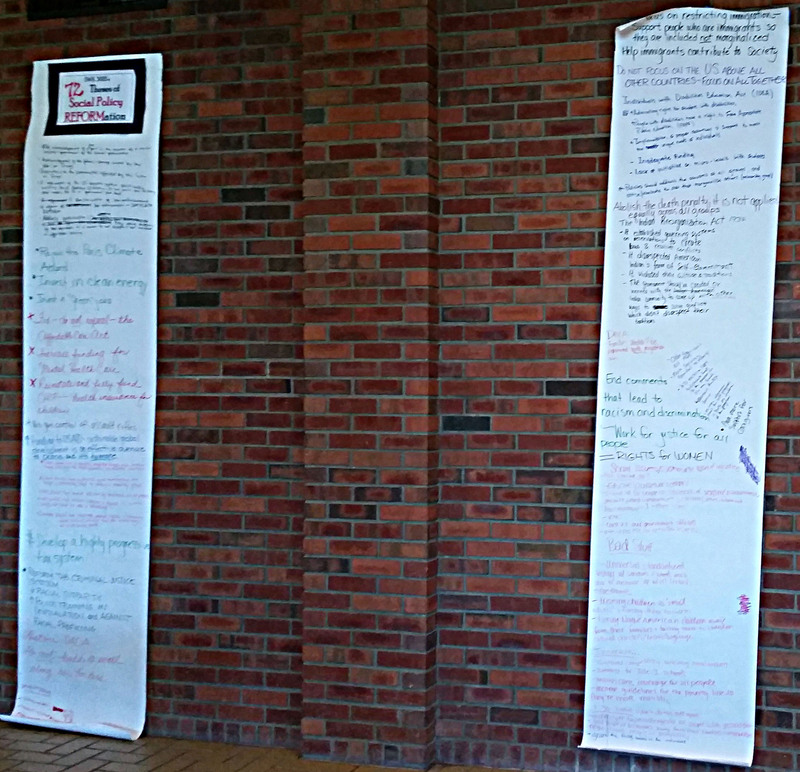 Our students spoke of their worry that these questions might convey a sense of haughtiness and cultural arrogance. Many of you know that in our program at Augsburg, students have learned to ask these tough questions of themselves and of others. We also learn that asking the difficult questions is a sign of genuine interest and respect, not of judgment and criticism. So, our students continued to ask more probing questions. What we soon learned is that for example, no one had ever questioned cultural colonizing with social policy. In other cases, Slovene students and faculty were already asking those very same questions. Early in my stay, I was introduced to the politics of the German occupation and the Slovene Partisan liberation movement during World War II. One evening I wandered into Trg Zvezda during what was a celebration for veteran Slovene Partisans. Bystanders in the crowd were kind enough to offer a brief history lesson on the German and Italian occupations during World War II. Later in the week, on a visit to Žužemberk castle, I asked one of our hosts more about the role of Slovene Partisans during the German occupation. This time I accidently stumbled into a sensitive conversation about both the Slovene Partisans and the Home Guard. I learned that in some cases, Slovene Partisans intimidated rural communities who in response organized their own militia called the home guard. On the other hand, members of the Home Guard accused their Slovene Partisan neighbors of espionage against their occupiers. Accusations by both the Slovene Partisans and the Home Guard lead to prison terms and in some cases, their execution. At the end of the war many Slovene Home Guard members were executed by the Yugoslovian government. The German military was defeated over two generations ago, yet the legacy of resentment and betrayal is still felt among neighbors and within communities. The story of Žužemberk, Partisians and the Home Guard reminds us that historical trauma is a universal phenomenon, one that we deny at our peril. I was moved on more than one occasion to remind my students how proud I was that they had chosen to study at Augsburg University. That their thoughtfulness and respect, their unflagging curiosity was an expression of their commitment to social work, social and economic justice. In reading their final journal entries I was again moved by their deep passion for our profession and our mission. One of the more troubling lessons was how in Slovenia, professional social workers are criticized and misunderstood. A lesson learned when hearing that some of the parents of the social work students were not happy with their decisions to become social workers. Misunderstanding of our profession is a universal phenomenon. A more inspiring take away however was knowing that some of our clinical social work students became more impassioned to work at the community and policy level. 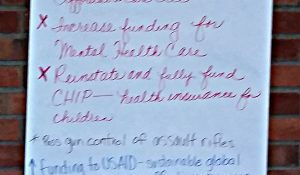 Likewise, our macro social work students expressed a renewed dedication to their work as policy makers and agents for social and political change. We gathered two weeks after returning to the United States. We gathered around pizza and pop to talk about what lessons have stayed with us since arriving back in the U.S.A. What I heard was that students learned about a community of professionals working hard for social and economic justice, a profession that was poorly paid and likely misunderstood. Basically, our students learned that there are others like themselves, in other countries, working for social justice and the welfare of all. 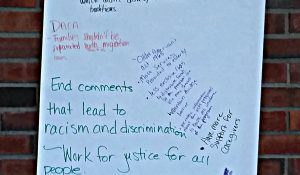 Finally, our students acknowledged that we have much to learn from others and we too have much to share in our pursuit of justice and universal well-being. Now, we turn to the summer 2018 and are looking forward to hosting our new Slovene colleagues and friends. Thank you, Profs, Lea, Ana, and Gabi, Jana, Liljana, Mojca and students Tina, Viktorija, Ana, Anže, Žiga, Nastja, Alma and Matea. And thank you Fakulteta za socialno delo. for the thoughtful editing from Lea Šugman Bohinc, especially for her counsel on the history of the German occupation during World War II. Last August, the National Association of Social Workers approved several updates to the NASW Code of Ethics. These changes go into effect January 1, 2018. See below for a quick summary of what’s new in the Code of Ethics. Hurricane Harvey continues to pummel Southeast Texas and now Western Louisiana. Images of families in boats, or wading through waist deep water move us to ask, “how can we help?”. We are told that the recovery from Hurricane Harvey will take months if not years. During the early stages of a disaster relief effort the best way to support Texas’ relief effort is to offer financial support. In the coming weeks, we will learn of other ways to support the communities and victims of this major disaster. However, if you are able and are interested in providing financial support we have put together a list of valuable websites that will help guide your decision. Charity Navigator is a non profit organization that provides information on a wide list of national and local charities. Charity Navigator has published a list of charities that are directly involved with the relief effort in South Texas. This list is updated periodically. Below is a short list of non-profit charities that are currently involved in the relief effort in South Texas. NECHAMA:Jewish response to disaster is a Minneapolis based relief organization preparing to send a self sustaining relief team to South Texas. Write “Hurricane Response – United States” on your check memo line. Environmental and community sustainability has been central to the mission of the Center for Global Education and Experience (CGEE) since the beginning, and students not only explore issues through coursework and but live out the commitment through daily life on campus and in the community. 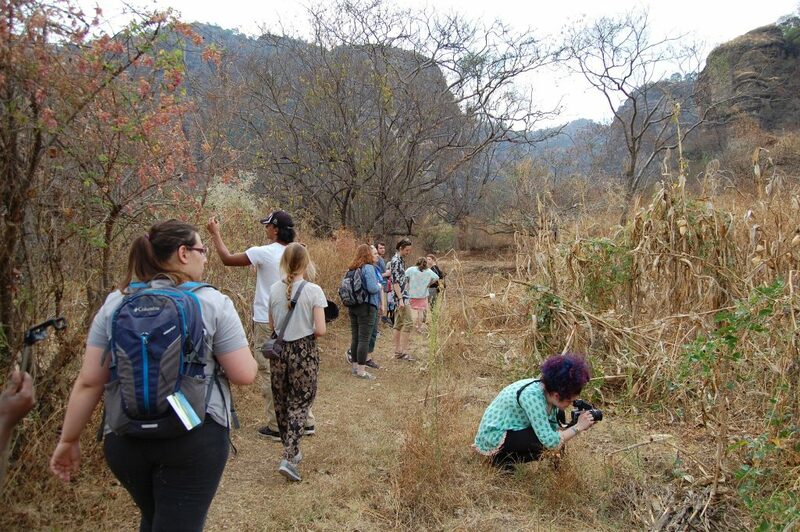 This spring break, eleven Augsburg students experienced that reality in during the inaugural “Food, Justice, and Sustainability in Mexico” course, earning credit for SWK 210 or POL 160.